And now for a happier story than the recent Costa cruise ship tragedy and tales of a Shakespearian captain. What you are looking at here is the 105-year-old former Canadian Pacific Great Lakes passenger ship Keewatin. At 3,856 gross tons and with dimensions of 350 x 44 feet, she has just been rescued from an uncertain future to become the centrepiece of a new resort development at her old Georgian Bay home port of Port McNicoll, Ontario. The Keewatin is shown at Douglas, Michigan, near Saugatuck, where she has been used as a maritime museum for the past forty-five years. She has been shorn of her lifeboats in order to lighten ship for a scheduled June tow from Douglas to Port McNicoll. In the foreground is the dredging equipment that was hired to cut the channel from Douglas that will free her. The Edwardian steamship was lying in a bed of mud until December 2011, when she was finally floated again, and after inspection was said to be in marvellous condition. This dredging, which is being paid for by the ship’s new owners Skyline International Development Inc, will also open up the dock at Douglas to small cruise ships such as Travel Dynamics’ 2,354-ton Yorktown, 257 x 43 feet, which is scheduled to call at nearby Saugatuck several times this year on her cruises between Detroit and Chicago. The Yorktown has a passenger capacity of 138, compared to Keewatin‘s 288 when she was in service between 1908 and 1965. For those wishing to cruise the Great Lakes in 2012, the Yorktown will be offering a total of thirteen 7, 10, 11 and 14-night cruises, with fares from $3,995 for seven nights, including the cruise, all port charges, lectures, shore excursions and wine with lunch and dinner. 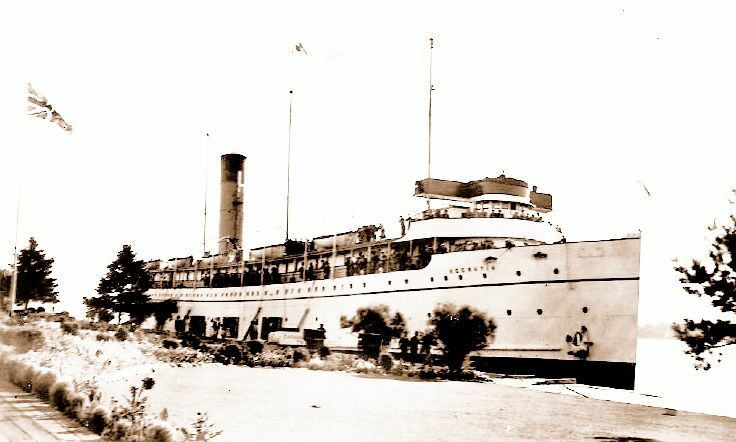 When she returns, the Keewatin, shown here at Port McNicoll during her days of regular service between Georgian Bay and Lake Superior, will become a floating community centre and centrepiece for Port McNicoll’s renaissance. Plans are to build a new resort hotel and condominiums and rebuild the old dockside railway station to its original plans. On board, Keewatin will also feature a museum on her main deck and a kind of market in her old main cargo deck, which in her last years was used to carry about forty cars. This will also be made available for community functions. Berthed very near to her old berth, from which she used to sail from every Wednesday for Sault Ste Marie, Port Arthur and Fort William (the last two now called Thunder Bay), the ship will become the hub of what has until now been a sleepy Ontario town. 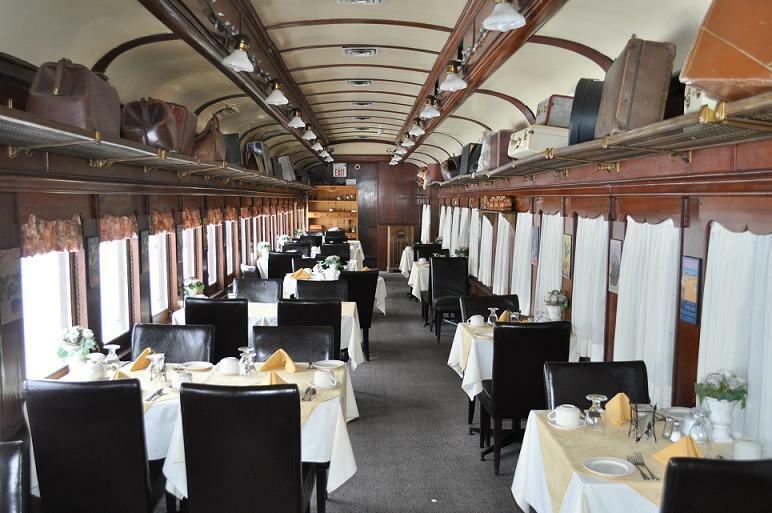 Just this month Skyline has also acquired a set of vintage railway rolling stock to become part of the scene. The port, with deep water, will naturally be seeking to attract a certain amount of cruise ship trade, and with an attraction such as the Keewatin will be well equipped to do so. 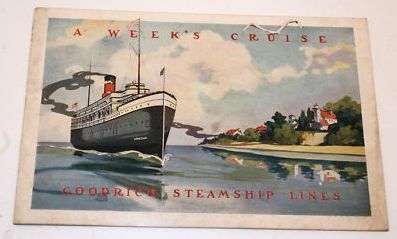 For more information on either the s.s. Keewatin or how to book a Great Lakes cruise in the m.v. 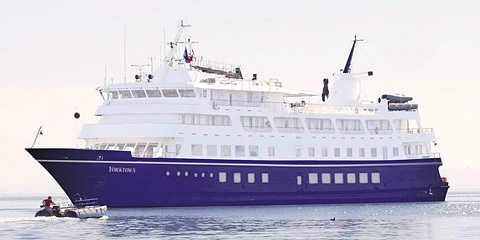 Yorktown please contact The Cruise People Ltd in London on 020 7723 2450 or e-mail cruise@cruisepeople.co.uk.